Rapunzel (Anna Maher) gets some bad news from her adoptive mother in Shoot the Glass Theater’s production of Into the Woods. Photo by Twin Cities Headshots. The recent success of The Band’s Visit at the Tony Awards reminds us that there is still great room for an intimately scaled, well-told musical tale. Intimacy is one of the foremost virtues of Shoot the Glass Theater’s current production of Stephen Sondheim and James Lapine’s classic musical Into the Woods. Shoot the Glass’s production takes place in the mainstage space at the Crane Theater in Northeast Minneapolis. Nine billowing strips of bare fabric are the only set and set decoration, swaying with characters’ entrances and exits. Even the witch’s tower is no more than a short stepladder, a minimalist and abstracted device that puts much of the attention on the actors bringing the story to life. There is little that’s extraneous in this production, putting more of the focus on the human drama. The choice of the Crane Theater’s mainstage space is literally an acoustic trap; lines by actors in the latter half of the stage can easily disappear into the surrounding curtains. Most of the action is shrewdly placed downstage by director Ryan Nielson, largely mitigating the issue, but you’ll still want to sit in the front two rows. 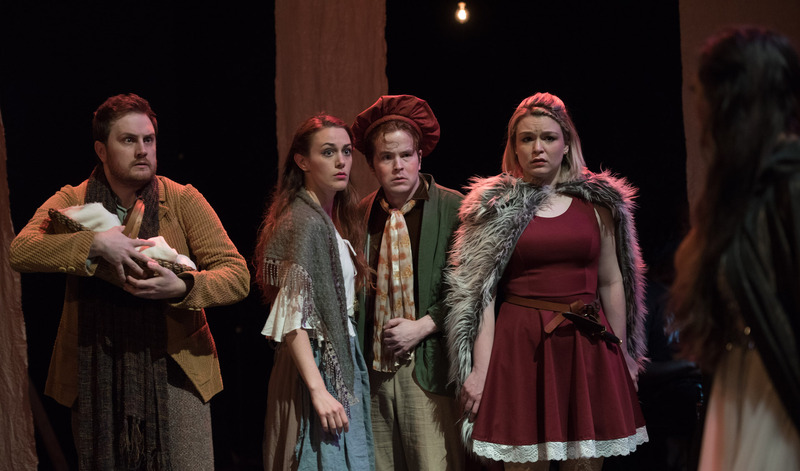 L-R: The Baker (Kyler Chase), Cinderella (Becca Hart), Jack (Andrew Newman), Little Red (Karissa Lade), and The Witch (Emily Jansen) confront a sticky situation with giant-sized feet in Shoot the Glass Theater’s Into the Woods. Some of the show’s minimalism works well and some doesn’t. The production is sprinkled with many small touches of visual humor, like the deliberately prominent bird whistles and the use of an abstracted, almost Cubist cow prop. These are a pleasant aspect; the minimal lighting is problematic. In general, this production is dimly lit. If eyes are the window into the soul, good luck seeing through the woods here – the use of very steep lighting angles casts long shadows across faces, masking expressions and leaving chests and stomachs better-lit than faces. This is a common problem for shows at the Crane, but for a show that plays so much with inner turmoil it’s surprising that it wasn’t addressed. Many of the production’s best moments come early: Becca Hart’s rendition of “Cinderella at the Grave”, a lot of The Baker’s Wife (Kaitlin Klemencic) musically and otherwise showing up her husband, and Anna Maher (as Rapunzel)’s beautiful siren calls. In Act II, Emily Jansen shines as The Witch, especially in “Last Midnight”. The sense of progression and purpose was notably weaker with the male cast. Shoot the Glass emphasizes an actor-driven process; whether this sense is linked with the process or not will take more shows to tell. In the end, it may even be a moot point – Sondheim and Lapine’s writing is certainly entertaining on its own, the production is well-sung and has a fine 5-piece pit ensemble, and has its moments where things really shine. You’re never too far from the on-stage action, which is a fine thing. It would still be nice to see more in these woods. Into the Woods plays at the Crane Theater in Northeast Minneapolis through July 1.